KINGDADS: Discipline in Public vs. Home and should it be the same? Discipline in Public vs. Home and should it be the same? This past weekend I encountered a family with some "active" children running around the local grocery store. I guess I really shouldn't say active, since this is a given for all kids. Isn't it? What I noticed most about watching this family is the number of times that both Dad and Mom whispered to their children. I could only guess at first what was being said and every time the parents whispered the kids stopped playing, for about 30 seconds. Then the kids were off to just being kids, much to the dismay of their parents. Finally, the mother stated very sternly and loudly enough for me to hear the phase, "Wait until we get home". Again, both kids straightened up and another 30 seconds passed by and then as before they were back to being kids. It occurred to me that the only benefit these parents were gaining were the 30 seconds of peace with each whisper/threat, but more so they were teaching their kids that while in public anything goes. 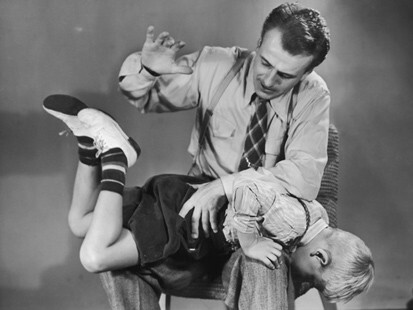 So the question is should discipline be the same in public as it is at home? I can answer with my own children that discipline is the same regardless of our geography. Do we have less than desirable situations out in public? Yes about once a year. We have some of those while at the comfort of our home as well. This topic echos another post I made awhile back, asking, and pleading with you to not spank your kids. More so, if you do spank, then please do so extremely sparingly. When I say sparingly, I mean spankings in my opinion should be limited to no more than five fingers or less over your children's lifetimes. To date I have never spanked my children and I don't foresee this ever happening at this point. Really what are we teaching kids when threatening to wait until we get home to discipline? Like any threat, you need to follow through. If you say you'll get it at home, then do it. I take away their video games. That's what hurts them. I tell them they cannot play video games for the rest of the day and I stick to it. It resolves that bad behavior right away. I know you have to use different tactics for different ages. Mine are 11 and 8.